Recently I came across a reference to a book on editing that caught my attention, partly because I hadn’t encountered many comprehensive guides on editing at that point and partly because this one was specifically aimed at translators. It turned out that the work had been around since 2001 and was now in its third edition (issued by Routledge in early 2014), so it was obviously popular and had been updated, too). 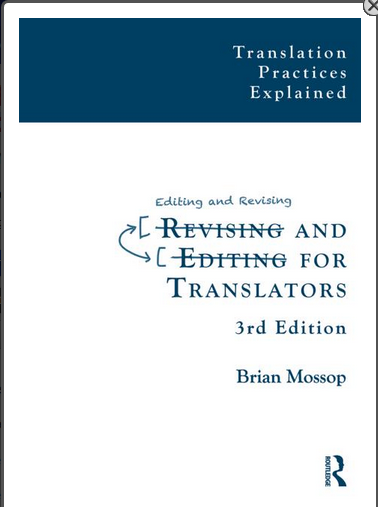 “Revising and Editing for Translators” is written by Brian Mossop, a Canadian who worked for the Canadian Government’s Translation Bureau for many years and now teaches editing/revision and translation at university level. The author’s considerable experience of revising translations and teaching students and teachers alike about revising and editing is reflected in the clear structure, real-life examples and broad scope of this work. Routledge’s edition of the book is 244 pages long and divided into 14 chapters. These are followed by six appendices (e.g. on assessing quality and grading texts) and a list of bibliographical references and other books and articles for further reading, plus a helpful index. There are a number of practical exercises and tips for further reading at the end of each chapter, which relate to the subject matter covered. This way of presenting material makes the book suitable for self-study as well as classroom use. I also like the amount of differentiation Mossop uses, which makes it clear how many different levels there are to editing and how many factors play a role in the choices editors make (cf. chapter 2, “The work of an editor”, chapter 3, “Copyediting” and chapter 4, “Stylistic editing”, for example); basically, chapters 2 to 7 all make this point. Mossop also makes a clear (albeit personal) distinction between editing and revising at the beginning of the book and consequently divides the work into two sections on each area. Chapters 2 to 7 are on editing, while 9 to 14 are on revising. In a nutshell, he takes editing to mean “reading a text which is not a translation in order to spot problematic passages, and making any needed corrections or improvements” (p. 29). As for revising, he regards this as a task “in which [translators] find features of the draft translation that fall short of what is acceptable, as determined by some concept of quality” (p. 115). In chapter 10, he discusses 12 parameters that play a role in revision, including accuracy, completeness, logic, facts, page layout and even typography (i.e. the use of bold, italicised or underlined text, capitalisation and colouring). 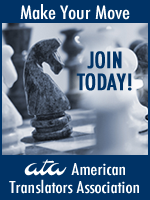 Chapter 11 covers degrees of revision (from “intelligible” to “polished”), whether or not full or partial checks should be done and the risks inherent in spot checking. Chapter 12 is about the actual revision procedure (e.g. which steps to take and in which order) and what you can do about any unsolved issues. ← International Translation Day 2018 – Go out, tell the world, be bold!